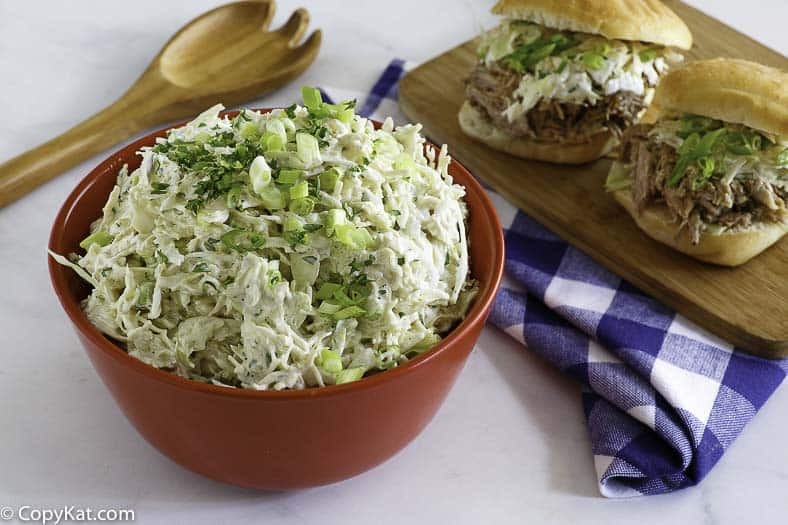 Houston’s Coleslaw is perfect for your barbecue, summer festivity, or when you want a light and refreshing side dish. You can make this recipe in a matter of minutes, and it tastes even better when you make this flavorful coleslaw recipe one day in advance. Houston’s is known for its consistent high quality and great tasting meals, including side dishes such as coleslaw. Houston’s Coleslaw is made from chopped cabbage, green onion tops, honey mustard, and more to make it taste extra special. This is definitely not your conventional coleslaw. What Makes Houston’s Coleslaw so tasty? Unique flavors makes Houston’s coleslaw stand out. 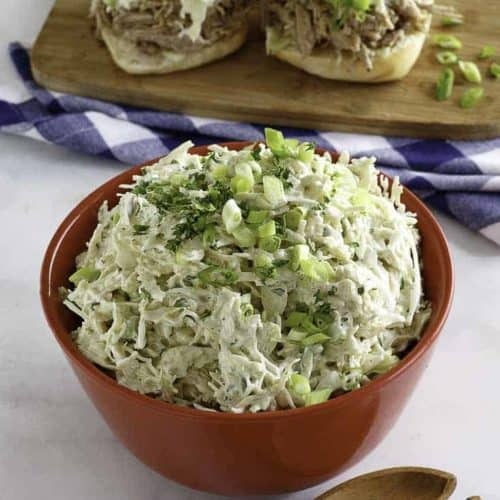 They add horseradish, and dill pickle relish to give their coleslaw something extra special. Sometimes a mayonnaise-based coleslaw can be too creamy. This perfectly seasoned coleslaw will soon become a favorite. The Dutch settlers in New York State grew a great deal of cabbage and had to come up with different ways to eat it. They made a salad out of shredded cabbage and called it koosla – kool means cabbage and sla means salad. A recipe from 1770 found in The Sensible Cook: Dutch Foodways in the Old and New World is made from slivers of cabbage combined with melted butter, oil, and vinegar. For those of you who are interested in making some traditional Dutch recipes, you can purchase this intriguing book from Amazon. What is the Best Kind of Cabbage for Coleslaw? There are many takes on coleslaw, but there is one thing everyone agrees on – coleslaw always contains cabbage. Many people don’t often venture beyond the popular head of green cabbage, but for a more colorful coleslaw, you can combine green cabbage with red cabbage and even mix in some savoy or Napa. Click here for a slideshow to learn about no less than fifteen varieties of cabbage. Remove any ugly looking outer leaves. Cut the cabbage into quarters. This makes it easy to then remove the core. Depending on the type of coleslaw you want, chop or slice the cabbage quarters. If you want thin shreds, you can use a mandoline or your food processor shredding attachment. You can buy bags of pre-shredded cabbage or coleslaw mix. I’ve even seen supermarket coleslaw mixes that include broccoli stems (delicious) and other kinds of vegetables if you’re feeling in the mood to try something a little bit different. How Long will Coleslaw Stay Fresh? Coleslaw that includes mayonnaise, like this copykat coleslaw recipe, will not stay fresh for very long. However, you can chop up the vegetables in advance, and they will stay fresh in your refrigerator in a sealed plastic bag for a couple of days. You can make coleslaw and freeze it so you always have some on hand. Get my family favorite frozen coleslaw recipe. Houston’s Coleslaw – this is a delicious way to make coleslaw. This take on Houston’s Coleslaw recipe is a delicious way to make a very gentle and fresh-tasting homemade coleslaw. 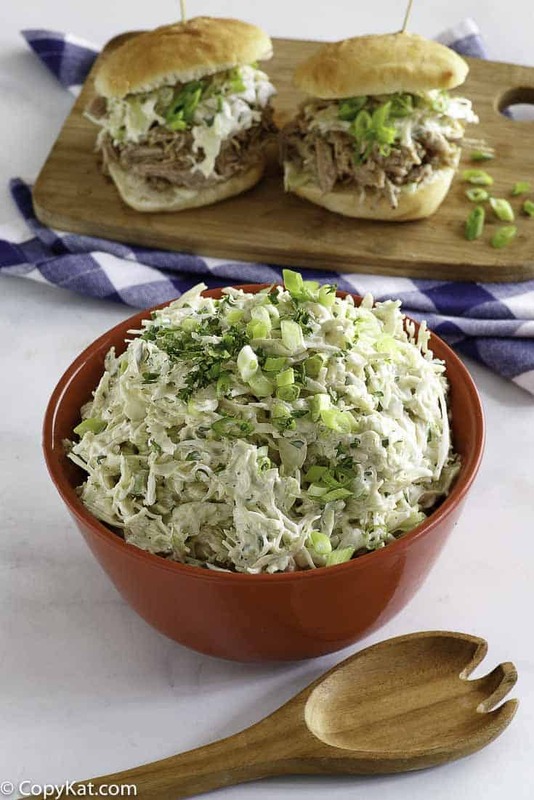 This slaw enhances your main course and does not overpower it. In a large bowl add chopped cabbage, parsley, green onion tops, and salt. Stir to make the cabbage mix uniform. In a small bowl combine mayonnaise, buttermilk, sour cream, brown mustard, apple cider vinegar, salt, sugar, horseradish, and dill pickle relish. Stir until well blended. Drizzle the coleslaw dressing over the cabbage. Stir to coat the cabbage well. This may be served immediately, but tastes better when served the second day. Salt the cabbage - before making the slaw, the salt will pull out the excess moisture and keep your coleslaw super crisp. 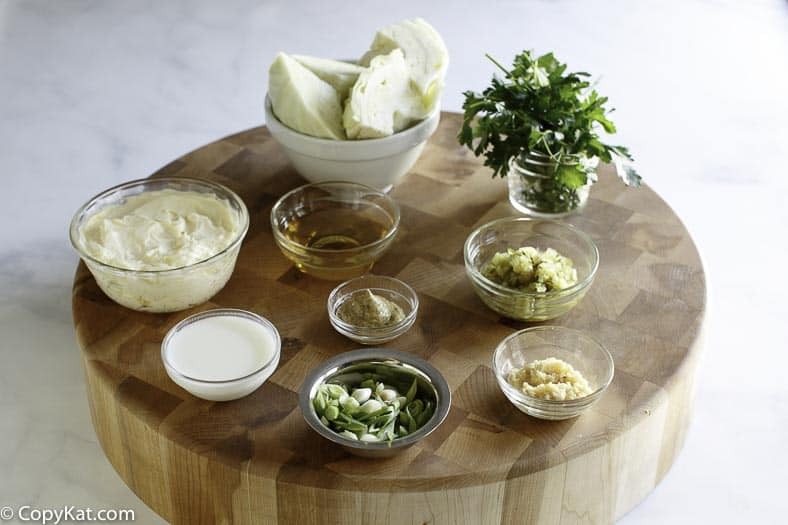 Adjust seasonings as coleslaw sits - the flavor will change as the flavors mingle together. Don't just serve it as a side! - Coleslaw is great on a burger, or even a hotdog! Try these great coleslaw recipes. I used to love Houston’s coleslaw also! I could have sworn I tasted tarragon and of course lots of scallions and parsley. Excellent! Thanks so much for getting this recipe. I think it’s one that’s also used by Houston’s sister resaurants – Gulfstream – and I’ve been trying to get the recipe for years. I tried it today and it’s a 99.999% match to the cole slaw I had at Houston’s last week! Thanks again! Thank you! We work very hard on those recipes. I love Houston’s Cole Slaw this is great thanks for posting this recipe!